From stay-at-home moms to globe-trotting executives, from singles to seniors, every modern woman has asked, "How do I juggle it all?" 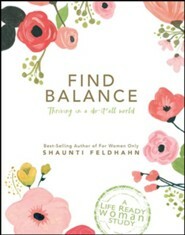 Now, Find Balance helps you discover God's road map to peace, place, rest, and delight in this crazy, contemporary life. 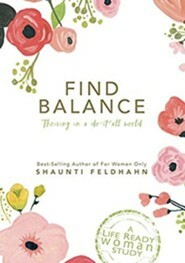 Based on her book The Life Ready Woman, Shaunti Feldhahn helps you find God's best for you. In this unique 8-week, video-guided study (video sessions are free online), you'll learn how to experience more of life, create biblical balance, have peace instead of stress, and develop a personal plan for fulfilling God's callings that He uniquely designed just for you. This special edition format includes two beautiful art prints and the Find Balance study, all packaged in a durable bonded leather, patterned sleeve. I'm the author/artist and I want to review Find Balance: Thriving In A Do-It-All World, Limited Edition.